Private 77875, 2nd & 1st TRB Leicestershire Regiment, then 4th Battalion Durham Light Infantry. Killed In Action 21st July 1918. Victory Medal and British War Medal. 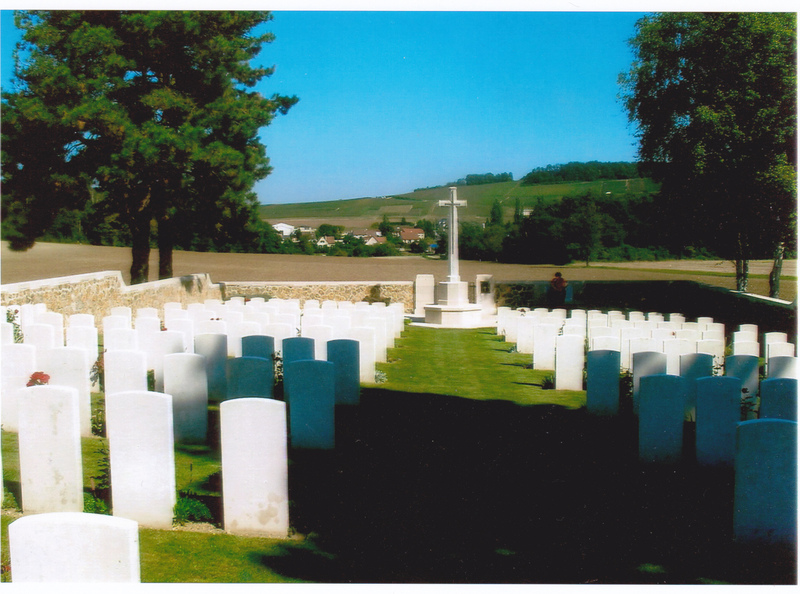 Courmas British Cemetery. Bert Widdowson died in July 1918. His name is on the ‘church list’ of those Bottesford men who served but his name was not added to the Bottesford War Memorial. However, he is commemorated on the memorial in the Institute in Sandiacre and on the Nottinghamshire Virtual Memorial. The Bottesford Parish WW1 Centenary Project is very grateful to Jonathan D’Hooghe for his assistance with the military details of Bert Widdowson’s WW1 service. Bert Widdowson was born in 1898 in Basford, Nottingham. His parents were James Joseph Widdowson (b.1872, Nottingham) and Emma Elizabeth (neé Spinks). They were married in 1897 in Nottingham. Sadly, she died in 1900, three weeks after the birth of Bert’s younger brother James Joseph (sometimes known as Harold, though in 1939 he was named Joseph Widdowson). In the census of 1901, James Widdowson, a grocer, was at 67 Duke St, Nottingham, with his son, Bert, aged 2, his step-brother Arthur Stephenson, aged 13, and a house keeper named Agnes Burton (probably no relation). Later in 1901, he married his second wife, Melina Mary Bennett. The 1911 census confirms his wife as Melina Mary Widdowson, adding that had been married for 14 years (in fact, they had been married for ten years), and lived in a boarding house kept by Mary Elizabeth Hill at 33, Derby Road, Nottingham. Neither of the boys, Bert and James, were with them at this date. James Widdowson’s occupation was hotelkeeper. Other guests at the boarding house included workers in the hosiery trade and lace industry, a confectioner, a shop assistant, a brass foundry worker and gauze makers. When Bert Widdowson signed his attestation papers in 1916, he was living and working at Hill Farm, Bottesford, where he was a ‘farm pupil’. He was 5 feet 8¼ inches tall, had perfect vision and a chest measurement of 35-38”. At this time, John William Dammes was working the farm. Bert attested in Grantham on 25th Aug 1916, aged 17 years and 362 days, but his papers were not completed until after his 18th birthday, on 17th January, 1917, when he was posted to the Leicestershire Regiment with service number 36852. On the 19th January, he became Private 77875 of the 2nd Training Reserve Battalion (Leicestershire Regiment) then was transferred to the 1st TRB, Leicestershires, on the 18th August, 1917, and another number, 3915, was entered on his Medical Record sheet. After completing training, on the 3rd October 1917 he was drafted into A Company, the 4th Battalion, Durham Light Infantry. This battalion was a 62nd Division Pioneer Battalion with the tasks of digging, building etc. but also fighting when required. 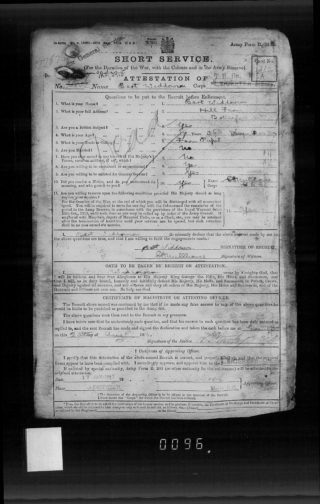 A Company Conduct Sheet issued on the 28th November, 1917, records that he was guilty of “losing by neglect 1 spoon”, for which the penalty was “pay for deficiencies”: the significance of this, apart from illustrating the trivialities of army discipline, is that it clearly confirms that he was Pte 77875, 4th Durham Light Infantry. He embarked from Southampton for France on the 28th November, 1917. He was then in France for a total of 236 days, before he was killed in action, aged just 19, on the 21st July, 1918. Between the 20th and 30th July, the 62nd Division was fighting in the battle of Tardenois, part of the 1918 Battle of the Marne. He grave at Courmas British Cemetery in Marne, a village some eleven kilometres southwest of Rheims, is maintained by the Commonwealth War Grave Commission. 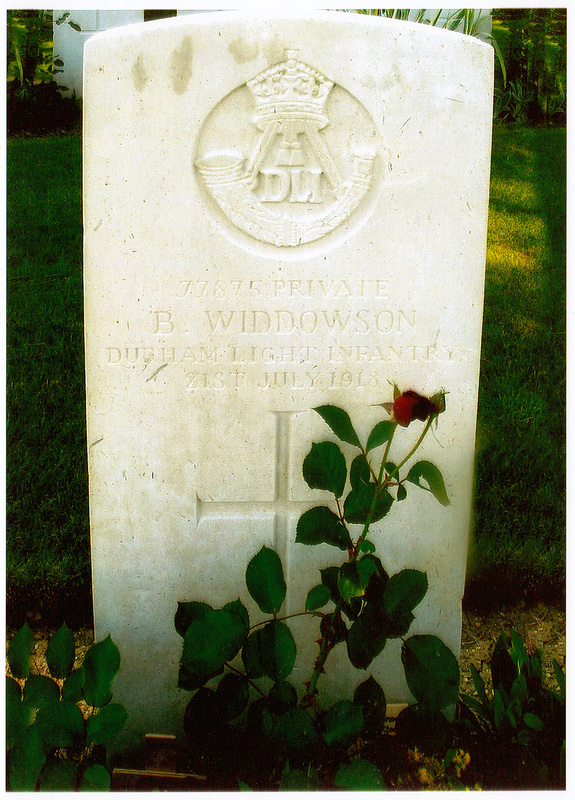 His next of kin was his father, J.J. 21Widdowson, Red Lion Hotel, Sandiacre. There is a note dated 29th November, 1921, that his father received his BWM and VM and his Death Plaque. This was after the family declaration of kinship was completed in November 1919. On this form Bert’s younger brother was named as Harold. However, in the Army Register of Soldier’s Effects, he was to be credited with £15.16s. 10d and his War Gratuity was £6.10s, to be paid to the sole legatee, his mother, Melina M. Widdowson. Bert’s MIC records his regiment as the Durham Light Infantry and his Service Number 77875. He was awarded the British Medal and the Victory Medal.